Pictured is guest speaker Patrick Stout with hostess chair and wife, Patricia Stout. 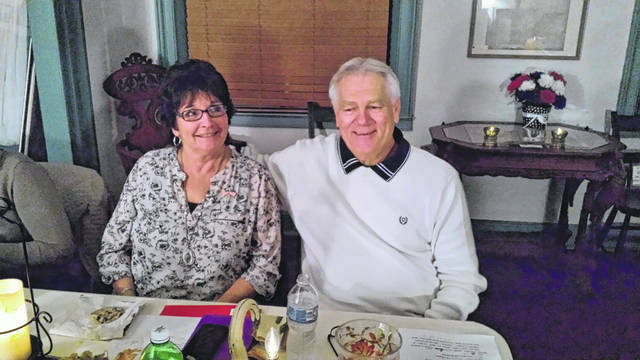 GALLIPOLIS —The Beta Alpha Chapter of The Delta Kappa Gamma (DKG) held its Nov. 10 meeting at The Our House Museum in Gallipolis. Cathy Greenleaf called the meeting to order and welcomed everyone in President Lynn Arnott’s absence. She thanked the program chair, Vicky Bryant, hostess chair, Patricia Stout and hostesses: Gwen Daniels, Vicky Bryant, Denise Payne, Mary Deel, and Dama Schultz for their organization and planning for the meeting. Denise Payne gave the blessing prior to the meal. Patrick Stout was the guest speaker. He told a story he felt was about courage, faith and sacrifice. His tale was of the four chaplains aboard the American transport ship Dorchester on Feb. 2, 1943 heading through the icy North Atlantic just off the coast of Greenland when it was hit by a German submarine torpedo. Of the 902 soldiers she carried, only 230 men survived. As the ship slipped into the sea, the four chaplains linked arms, grasped the railing of the ship together, and began shouting encouragement to the men in the sea. One survivor, John Ladd, called it “the finest thing I have seen or hope to see this side of heaven.” Stout felt the chaplains showed self-sacrifice, broad-mindedness, spiritual passion, devotion to troops, and everything that embodies the highest that men of God in war ever hope to achieve and they set a vision of greatness for future generations. Visitors walking through the memorial chapel at the Pentagon or praying in the community chapel at West Point can look at the stained-glass windows that celebrate the four Dorchester chaplains. Mary Deel led devotions centered around Veterans Day and Thanksgiving. Reports by the secretary and treasurer were given and approved. A thank you note from Maggie Bostic, a recent scholarship recipient, was read to the membership. Doris Lanham reported that the change to the bylaws regarding the Christmas charitable giving will be voted on at the February meeting. The proposed change states that if there is no membership from the county attendance area then it will move to the next county in the rotation. Oak Hill was overlooked in the charitable giving last year so a motion was made and passed to donate to Oaks United. A motion was made and passed to purchase luggage for the foster care program in Gallia County. Karen Waugh reported that the scholarship committee has proposed four options for giving out scholarship money in the future. These proposals will be emailed to members so that they can make an informed decision at the February meeting. If members have any questions or do not get the information through email, they may contact Karen Waugh for clarification. A vote on money allotted for the printing of the DKG booklet to be donated to the scholarship fund in the future will also be voted on in February. Door prizes of antique teacups filled with fall items were awarded to Kay Adkins, Karen Waugh, Jane Ann Slagle, Andrea Gannaway, and Nancy Hood. The meeting was adjourned and closed with the singing of the DKG song. The next meeting will be February 9, 2018 at 6:30 p.m. at Simpson Chapel in Rio Grande. DKG is a professional association of women educators whose primary mission is to support the professional development of women in education.